If you have ever dreamed about owning your own kegerator and you happen to have an old running refrigerator in your garage then you are almost there! Add a handful of parts and about two hours of your time and you can start serving beer from your very own tap to your friends and neighbors as soon as this weekend!!!! 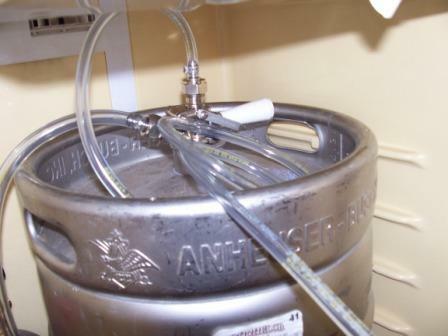 This is a step by step guide to build a home kegerator that will hold a full size 1/2 barrel keg, a pony keg or one of the tall slender draft kegs. 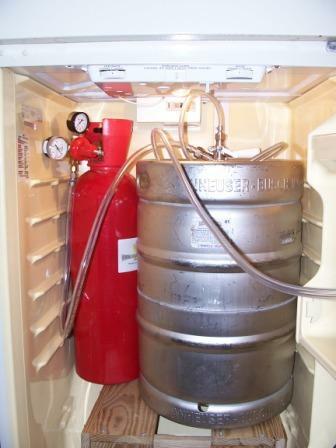 A draft beer kegerator is a great home project that can be completed in less than one day. 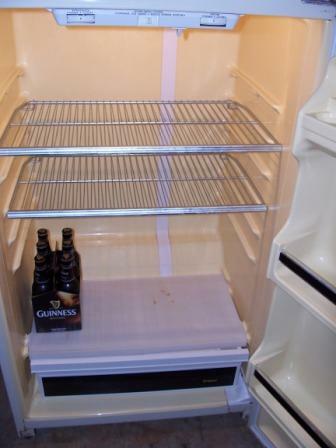 These instructions will help you convert your used refrigerator into a home draft kegerator. The same conversion can be done for two of the tall slender kegs by mounting two taps through the door and splitting the CO2 line with a tee. 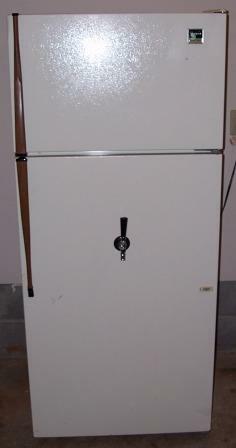 Beer dispensers have been made from just about all types of refrigerators and freezers over the years. 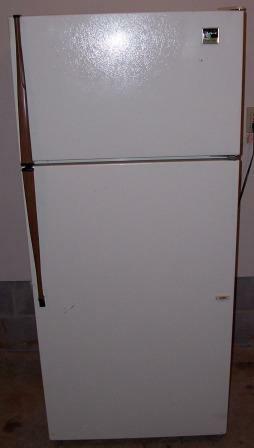 The ideal candidate for a home draft kegerator is an old unused refrigerator. These instructions show you how to mount the beer tap through the door. 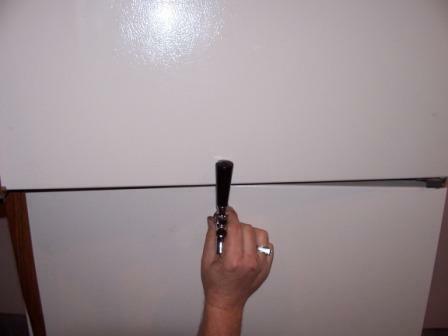 The faucet can also be mounted through the side of the fridge wall. 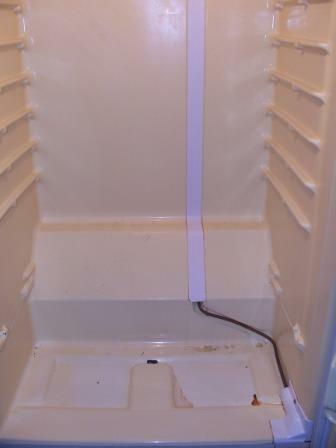 Just make sure that the refrigerator is unplugged before drilling any holes through the side. brand will last many years while a cheap Chinese regulator will last a year or two. These instructions will guide you through converting a full size refrigerator into a completely self contained kegerator for draft beer. When, done, everything will be completely self contained, including the CO2 tank. This project stared out as a typical home refrigerator with removable shelves and a drawer in the bottom. Notice the one lonely 6 pack of Guinness? At least my Son has good taste! Start the conversion by pulling out all of the shelves and then pull out tray in the bottom. 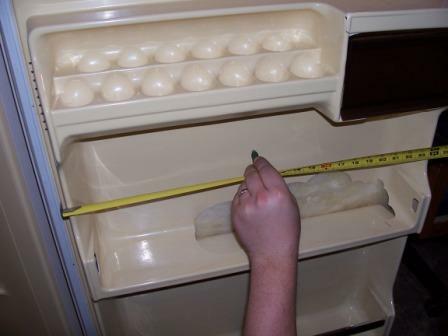 Most refrigerators will have a sloped back like this one has. 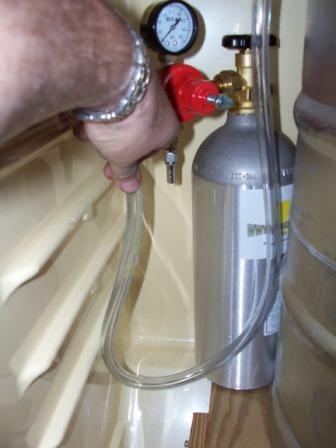 The sloped back will prevent you from sitting a keg directly on the refrigerator floor. The solution is to build a raised shelf across the bottom. We built this one from a couple of pieces of scrap 1X6 boards. 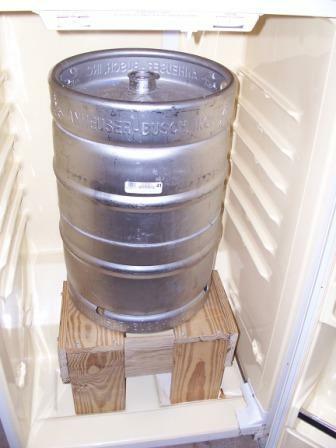 You can also build a shelf from a 2X4 and plywood and in some refrigerators, you can just put a milk crate in the bottom & set the keg on top of the milk crate. Here's a picture of a full size draft keg sitting on our shelf. As you can see, it fits great. The next step is deciding where to mount the beer faucet. This is a good example of where not to mount your beer faucet. If we were to mount it here then I would knock the beer faucet open every time I tried to open the freezer. 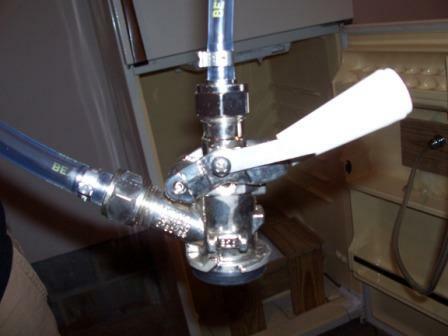 You need to mount your beer faucet even lower if you plan to install a taller commercial tap handle. Inside door shelves are other features that you need to consider when locating the beer faucet. 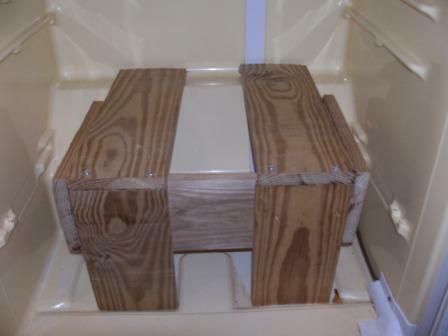 You can cut out the inner door liner and replace it with a sheet of plywood but this can turn into a major project because once the liner is out, you'll find that there is not much in there to mount a sheet of plywood to. We did not want to cut out the inner liner so we located the beer faucet below the egg tray. We used a tape measure to mark the center of the door with a sharpie marker. Drilling a hole from the inside first guarantees that you none of the door liner features get in your way. 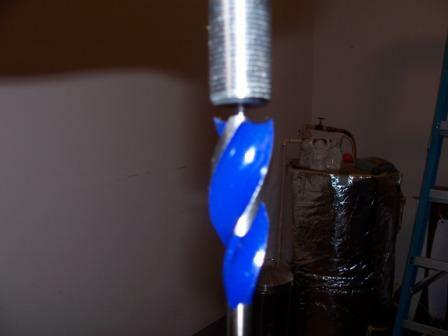 Another picture showing the drill bit through the outside. The hole is nicely centered because of the careful measuring we did earlier. 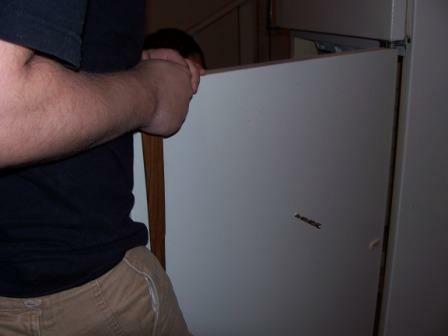 You will need a 7/8" drill bit to drill the hole through the door for the beer shank. This picture is of the end of the beer shank against a 7/8" drill bit. It's likely that you will not find a metal drilling bit this size at your local home improvement store. But the steel in the door is relatively thin and you can drill through with a good wood bit providing you go slow & lubricate the bit to keep it from getting too hot. Here we are starting to drill from the outside. Use the hole you drilled from the inside as a guide and take your time. Once you break through the outside, just keep going and drill through the inside. But don't push on the inside door panel too hard or you'll crack the panel. The door lining is very thin and flimsy and it will need reinforcing to hold up against the tap handle being pulled all the time. 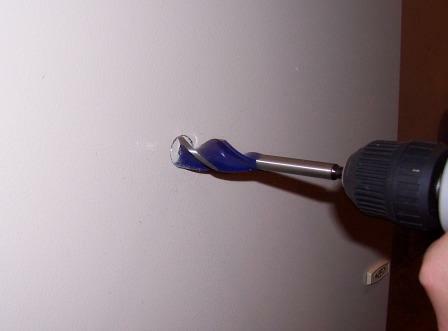 Drill the same size hole through a piece of wood to use as a backing inside the door. We made our reinforcement from another piece of the same 1X6 we used to build the self earlier. 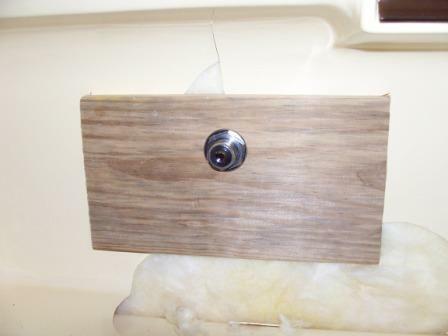 Once the board is drilled, remove the hose barb (if attached with a nut) and the retaining nut and thread the beer shank through the refrigerator door from the outside. Slide the reinforcing board over the beer shank, screw the retaining nut back on and tighten. 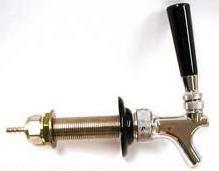 If the beer shank came with a hose barb that was attached with a nut, re-assemble it to the shank. 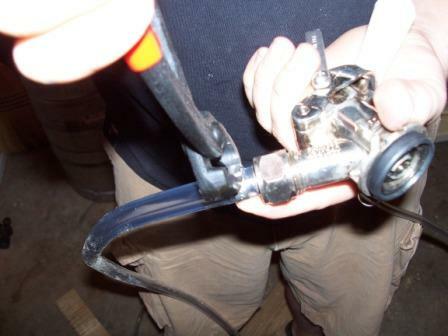 Attach one end of the beer line to the hose barb and clamp. It helps to soak the end of the beer line in very hot water first to soften it up. 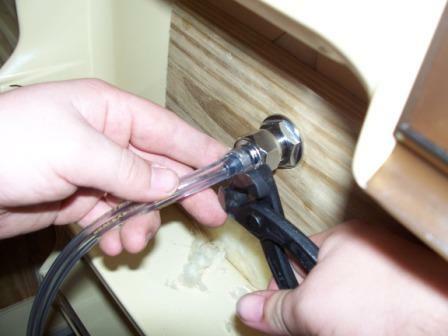 Note: We use Oetiker clamps in our kits and the picture shows is crimping a clamp with an Oetiker tool. A medium size pair of wire cutters or nail nippers works just as. You can also use stainless steel screw type hose clamps, available from your local auto parts store. Screw the 1/4" hose barb, beer nut & beer washer onto the Sankey coupler output. Attach the other end of the beer line to the hose barb. Note: Our kits come with 6' of beer line. Don't cut the line even though it is obviously too long! 6' is the correct beer line length to help prevent foaming. Now attach one end of the 3/8" or 5/16" (either will work) CO2 line to the gas in of the Sankey coupler. Here is a picture of the keg coupler with both lines attached. The CO2 goes in from the side and the beer comes straight out the top. Go ahead & tap an empty keg and place it in the refrigerator. Notice that we coiled up the extra beer line and laid it on top of the keg. It's critical that you keep the beer line 6 feet long to help prevent foaming! 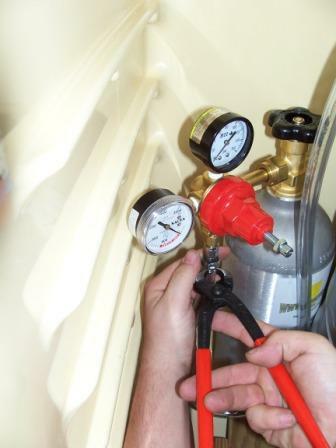 Place the CO2 tank and regulator in the back corner of the refrigerator. Measure the CO2 line and cut off the excess, leaving plenty of slack so that you can pull the CO2 tank out to get filled later. 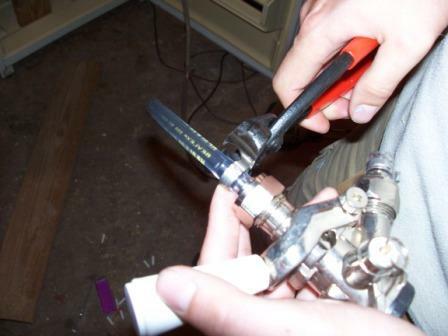 Attach the CO2 line to the regulator output. There's even room for a 20 pound CO2 tank in the refrigerator!